An anthropomorphic robot, called BIP2000, has been designed by the Laboratoire de Mécanique des Solides de Poitiers and INRIA Rhône-Alpes. Shape and performances of the robot are close to the human ones. 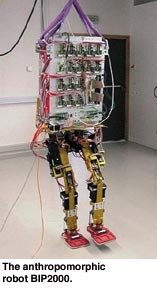 The robot has 15 active joints and environmental sensors, and its control architecture is based on advanced concepts of safe real-time programming. It will be demonstrated at the World Expo 2000 in Hannover. This paper presents an overview of the control problems which underlies the design of this class of systems. The ability of legged machines to pass obstacles or to move on uneven terrain in a low-invasive way is in general better than that of wheeled robots. This gives rise to outdoor applications as various as agriculture and field robotics, demining, exploration, forest exploitation. When considering structured environments, legged systems, and particularly biped ones, look well-suited for climbing stairs, walking through corridors or moving and acting in rooms designed for human occupancy. Like Honda did for his P2 robot, this tends to privilegiate the choice of designing robots in an anthropo-morphic way, as soon as they are intended to be general-purpose, for example in human assistance. Biped robots share many problems with the other classes of mobile robots: perception and understanding of the environment, friendly interaction with humans, autonomous decision making, grasping and manipulation. Forgetting these aspects, we focus here on what is specific to biped robots: the analysis and the control of their motion. The interest of biped locomotion is that it combines high capacities of mobility with a small convex hull of contact points. Besides, since the system is naturally unstable, control methods have to be very efficient and safety aspects are mandatory, any fall being liable to result in a fatal failure. This needs to revisit the classical concept of stability with a point of view different from the classical one used in automatic control. Furthermore, the unilaterality imply the semi-positivity of normal contact forces and the existence of friction induces bounds on the tangential forces. Both of them can be expressed as inequality constraints on the Lagrange multipliers, . The normal forward motion of a biped robot is a cyclic succession of phases characterized by the variable dimension of involved contact constraints and by transitions between successive phases. The number of constraints is maximal in double support with the two feet flat, and may vanish in the extremal case of the flying phase in running. According to the considered case and to the rank of T (always less than the dimension of the configuration space), and owing to the contact forces in the RHS of the above dynamics, the system can be seen as either underactuated, fully actuated or overactuated. Furthermore, transitions between phases may correspond to impacts which result in abrupt changes in some state variables. In addition to these problems of hybrid dynamics, and even within a single phase (ie without changing the set of active constraints), the control problem is difficult. In a classical robot, the constraints are bilateral. Therefore, it is in general possible to reduce the configuration space of the system in order to get T the identity and to suppress inequality constraints. Passive control techniques, like computed torque or enhanced PD control are then sufficient to ensure the tracking of a trajectory in the q-space or in any other space diffeomorphic to it. Stability is then understood in the Lyapunov sense, and corresponds for example to asymptotical vanishing of the tracking error. In the case of biped robots, the goal is rarely to accurately follow a joint space trajectory. When the robot is walking, he has to progress in the desired direction whithout falling; when the robot stays in the same place while performing some task, it should also maintain his static equilibrium (again avoiding to fall) despite the needed motions of his links. Let us imagine a robot standing at a stationary position, ie having his joint variables regulated at a given value. If we slightly disturb this equilibrium, the robot can be driven back to its goal position by a classical joint position control in closed loop. If the disturbance is large enough, this is not sufficient and the robot will avoid to fall only by stepping forward, i.e, changing his reference trajectory. This illustrates the fact that, to be stable the system has also to be able to generate the reaction forces and moments which are needed for preserving the constraints. In that sense, the Lagrange multipliers can be seen as particular inputs of the system. This shows also the interest of having force/torque sensors in the feet or the ankle in order to get the required information. Finally, this problem can be mathematically expressed properly using the concept of viability. Without details, the basic idea is to stabilize a set instead of a trajectory in some given output space. This can be for example realized by parametrizing a set of optimal trajectories, ie extending the state space. Expressing the on-line problem in terms of linearly constrained minimization then leads to the need to solve at each time a Quadratic Programming problem. The use of generalized predictive control is also a possible alternative.